Upgrading your window treatments is a great way to spruce up the interior design of your home while also offering a touch of style, comfort, and some much-needed flexibility. Regardless of your taste or existing decor, you’re bound to find blinds and window coverings that suit your preferences and colour scheme. 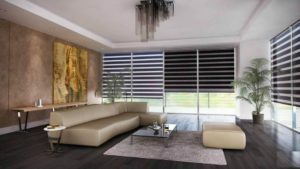 Whether you prefer the versatility of zebra blinds, the elegance of Roman blinds, or the sustainability of honeycomb blinds, the right custom window coverings in Calgary can make all the difference for your personal space. Each type of window dressing has its own unique set of characteristics and features that makes it the perfect fit for any room in your home. Your home is your personal space and as such, it’s important that you take excellent care of it and decorate it the way you see fit. After all, you and your family are the ones who have to live in it. Homeowners often have a tendency to view the resale value of their homes as more important than the personal opinions of their own family members. Curb appeal is certainly imperative if you view your home as an investment and have future plans to downsize or sell your home. However, it’s also important to be happy with the home you have while you and your family are still living there. Installing high-end, stylish, and sustainable window blinds in Calgary is a great way to boost its curb appeal and value while also providing you and your family with the protection and privacy you need in your home without breaking the bank. There’s a reason that zebra blinds are incredibly popular right now. They’re versatile, highly durable, affordable and easy to install and maintain. Choose from a wide assortment of customizable colours and styles that are sure to match your existing interior decoration. Serving as a modern alternative to classic horizontal blinds, zebra blinds typically contain the same type of valance that’s common in roller shades. You can choose between manual or automatic operation. Manually operated zebra blinds are equipped with a drawstring on the side that you can pull up and down to adjust your shades to the appropriate length. Automatic operation is slightly more expensive, but it allows you to adjust the blinds using a remote control that can be operated from any room in your home. Traditionally, roller blinds consist of one long piece of fabric that wraps around a plastic casing. The casing is measured and fitted directly into the interior or exterior top portion of your window frame. Like zebra blinds, you have the option of choosing between a manual side-winding chain mechanism or a motorized control that allows you to maneuver the blinds remotely. Roller blinds are ideal for windows of all sizes including sliding glass doors, patio doors, bi-fold doors, hallway windows, and skylights that are typically out of reach. Depending on your preferences and the amount of sunlight you get in each room, you can choose from customized colour and feature options including blackout or sheer blinds. Dual roller blinds serve as a massive improvement on their original single roller counterparts. With a single roller blind, you can only choose between an opaque or sheer fabric. On the other hand, dual roller blinds provide you with both options. The external layer is composed of a highly UV resistant material, which is meant to block out harmful sunlight that can damage your furnishings from prolonged exposure. It also provides an additional layer of semi-privacy to deter passersby and nosy neighbours from peering into your home. Even though people on the outside can’t see into your home, your view of the outside remains unobstructed. A second internal layer works in combination with the external layer to completely block off any residual sunlight that the external layer lets in. This is ideal for times when you need total darkness and privacy during the day, which makes it the perfect window covering option for bedrooms and bathrooms. Taking your lifestyle into account is just as important as your furnishings when it comes to choosing between single and dual roller blinds for your home. If you happen to work nights and sleep during the day, dual roller blinds are the obvious choice. Roman blinds are similar to zebra blinds in style but vary in functionality and structure. Unlike zebra blinds, Roman blinds don’t have spaces between the vanes that can be opened or closed to let in or block out sunlight. Instead, Roman blinds have stackable layers that connect evenly when closed, but are completely smooth and free of wrinkles when drawn. Roman blinds were used for centuries in the homes of dignitaries, but their versatile and elegant design makes it easy to fit them into modern home designs. Honeycomb blinds are also referred to as cellular shades by industry experts, thanks in large part to their multi-layered cells. Much like zebra and Roman blinds, the cells in honeycomb blinds can also be opened and closed. This allows users greater lighting and temperature control even when the blinds are lowered. Proven to help reduce monthly energy expenditures, these blinds come in a wide variety of colours, styles, and custom configurations to fit within your home. If you’ve been searching for “custom window coverings providers near me”, then look no further than Sara Bella in Calgary, Alberta. Whether you’re looking for custom zebra shades, custom roller shades, honeycomb blinds in Calgary or Roman window blinds in Airdrie, we have exactly what you need. Contact us today to make an appointment to view our wide selection of high-quality blinds or to discuss your made-to-order blind options.